I love this simple assembly. It’s full of fruity sweet grapes, crunchy earthy celeriac, soft rich goats cheese and slightly bitter toasted hazelnuts. I add fresh thyme and make a dressing with honey, two flavours I really like and that work so well with the other ingredients. If the hazelnuts have their skins on, remove them by roasting the nuts in a dry pan on a high heat for a few minutes. Then gather them in a tea towel and rub with your hands – the skins flake away very easily whilst the nuts are hot. Toss the celeriac, apple, 1tbsp of the olive oil, juice of half the lemon, salt and pepper together. This dresses the components, but also prevents the apple and celeriac from browning. 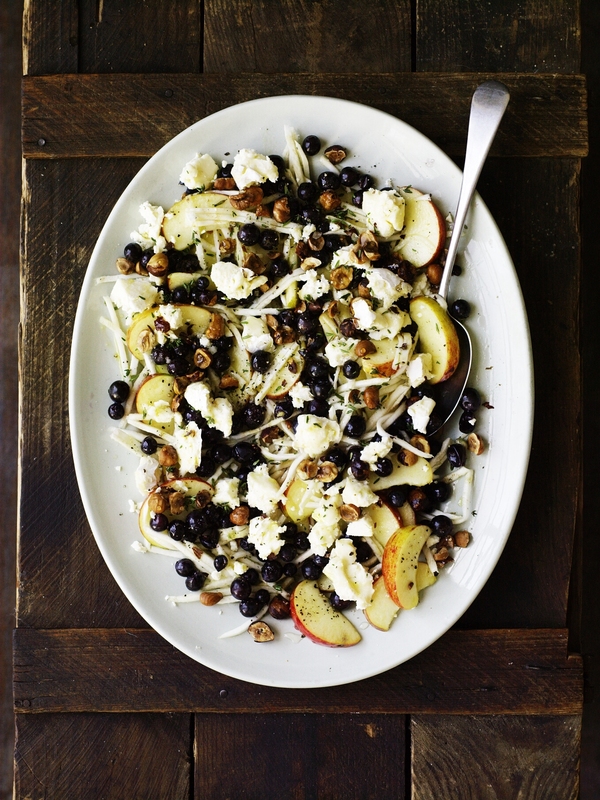 Choose a large serving platter, or four individual starter plates, scatter the apple and celeriac over the base of the plate, followed by the grapes, crumbled goats cheese and lightly broken, toasted hazelnuts. Strip the leaves from the thyme, and sprinkle these over as well. Finish the salad by trickling over the runny honey, a good spritz of lemon and the remaining olive oil.